The eighth in an on-going, near thirty-year collaboration between Stratford wood engraver Gerard Brender à Brandis and the Porcupine’s Quill that started in 1980 with the publication of Wood, Ink & Paper, which has sold almost 5000 copies in 28 years. 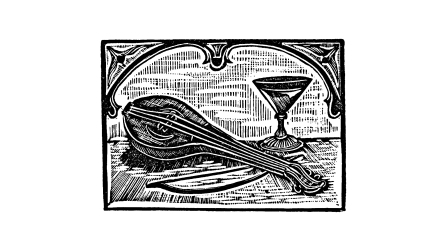 Twenty-four new engravings which depict all 27 musical instruments mentioned in Shakespeare. A companion volume to A Gathering of Flowers from Shakespeare (PQL 2006). Make the sun dance. Hark you! Music-making with the help of instruments is as old as human history. It is encountered in every part of the globe and in every kind of human society, whether primitively tribal or modern and urban. In Shakespeare’s time four hundred years ago in England, there were musical instruments in the country, for instance, Shakespeare’s Stratford-on-Avon and surroundings, in the larger towns, especially London, and at the courts of Queen Elizabeth and King James I. In the London of Queen Elizabeth’s father, Henry VIII, Sir Thomas More, his famous statesman and author of the Utopia, had his daughters instructed in singing as well as exquisite playing of soprano, alto, tenor and bass recorders, and different sizes of viols. With these they participated in the consorts, that is small ensembles of instruments, with which More entertained his distinguished guests in his sumptuous home. Such entertainment became a custom widespread both at court and in the houses of the wealthy in Shakespeare’s time. Neither opera nor larger ensembles combining wind, string and percussion instruments existed yet in Shakespeare’s London, though they were beginning to be developed then in Italy. The symphony orchestra did not appear until near the middle of the eighteenth century. In his plays and poems, Shakespeare alludes to twenty-seven different instruments, a larger variety than is found in the works of any of his fellow dramatists, like Marlowe and Ben Jonson. When we worked on this booklet, we needed to decide what the best order might be for describing these twenty-seven instruments. 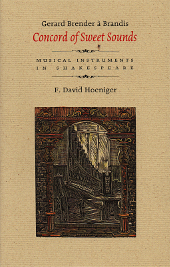 The basic kinds of musical instruments have been classified in different ways. Scholars tend to prefer scientific classification based on the principle of how the sound of different instruments is generated: by an air column, a stretched membrane, a stretched string, etc. But better for our purpose is the way the musicians of modern orchestras themselves draw basic distinctions among wind (more particularly woodwind and brass), string (plucked or bowed or struck), percussion (most of them struck or shaken), and keyboard instruments. The latter permit the making of several sounds simultaneously, as on a piano or organ. Yet it seems to us still more essential to keep in mind the basic differences in the use and function of the different instruments, where and by what kinds of people and on what occasions they were used. So we begin with the string and other instruments that were used singly or in consort at court and in the homes of well-to-do citizens, followed by those used in popular country music. Next comes the horn used during the hunt, then the mainly brass and percussion instruments used on royal or military occasions and parades, and finally the bells of church towers and the organ. For each instrument, we quote a relevant line or passage from Shakespeare, and explain its context. A member of the Wood Engravers’ Network, Gerard Brender à Brandis has produced hundreds of drawings, wood engravings and watercolours of plants, landscape, buildings and musical instruments. These images have appeared in books, including Wood, Ink and Paper, At Water’s Edge and Portraits of Flowers (all published by The Porcupine’s Quill) as well as in his own handmade editions. 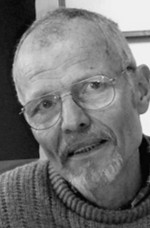 His work is represented in the collections of the Royal Botanical Gardens (Hamilton, Ontario), the Missouri Botanic Garden, the Arnold Arboretum and the Hunt Botanical Library. His garden and his studio are located in Stratford, Ontario. 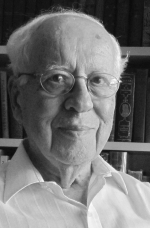 F. David Hoeniger is professor emeritus from Victoria College, University of Toronto, where he taught for many years in the Department of English. He is also a former director of the university’s Centre for Reformation and Renaissance Studies. Professor Hoeniger is the author and editor of numerous works on Shakespeare, his work and his times, including Medicine and Shakespeare in the English Renaissance (1992), and Science and the Arts in the Renaissance (edited with John W. Shirley, 1985). His editions of Shakespeare include the Arden Pericles (1963) and the Penguin version of King Henry the Eighth (1966). Professor Hoeniger lives in Toronto.